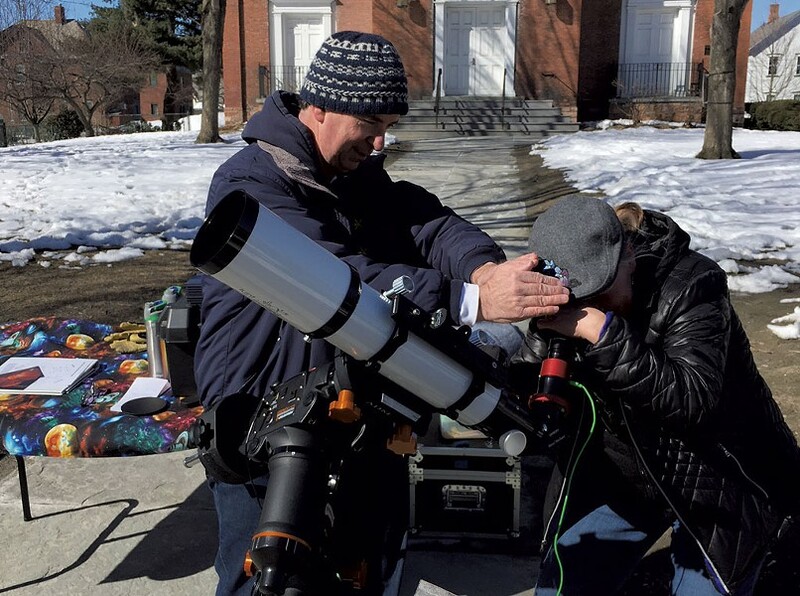 About 10 stargazing members of the Vermont Astronomical Society had their telescopes pointed skyward on Saturday night at the top of Church Street in Burlington. The gathering on the lawn of the First Unitarian Universalist Society of Burlington was meant to coincide with Earth Hour, an annual event intended to highlight climate change by extinguishing man-made lights. But the city never turned off the lights in the area as planned at 8:30 p.m., the appointed time for the event, according to society president Jack St. Louis. The light pollution proved no bother for the cosmic crew, which made do on a beautiful cold and clear evening. "For some reason, it got missed," recalled St. Louis. "But it didn't much matter because the moon was so bright." The society set up around noontime and used a funnel projector on a telescope so passersby could safely view the sun. In the evening, the group erected eight telescopes and invited people strolling by to take a peek. About 100 took them up on the offer. Most of the astronomers trained their scopes on the moon, but St. Louis said some also observed the bright star Sirius and the Orion Nebula. The latter is a fantastical purplish sight described in Mayan culture as "a cosmic fire of creation," according to NASA. Saturday marked at least the fifth year that the club has participated in the Earth Hour event, according to St. Louis. The club's been around since 1964. St. Louis, a Burlington resident, joined in 1966 as a teenager. Like many of its members, St. Louis considers stargazing a hobby. He's retired but worked for years in the information security division at the University of Vermont. Now he has more time to dedicate to the club, which counts members from across the state. "We have all levels of expertise and backgrounds," he said. "We like sharing the sky with people and talking about what we see in our telescopes." The cosmos, he said, "is spectacular."